Once again, it seems to have been ages since I last did any blogging. There’s not been much to blog about up until now. It was way back in February when I was last compelled to write on my blog. I’d watched ‘Why We Ride’ for the first time and felt all warm, fuzzy and inspired. It’s probably worth a read if you haven’t as this post follows it (click here if you’d like to take a look). In summary, I wanted to let motorcycles take their fair share of my life by sharing them with my family. After a night of research, I decided to get my hands on a Razor MX350 Dirt Rocket. 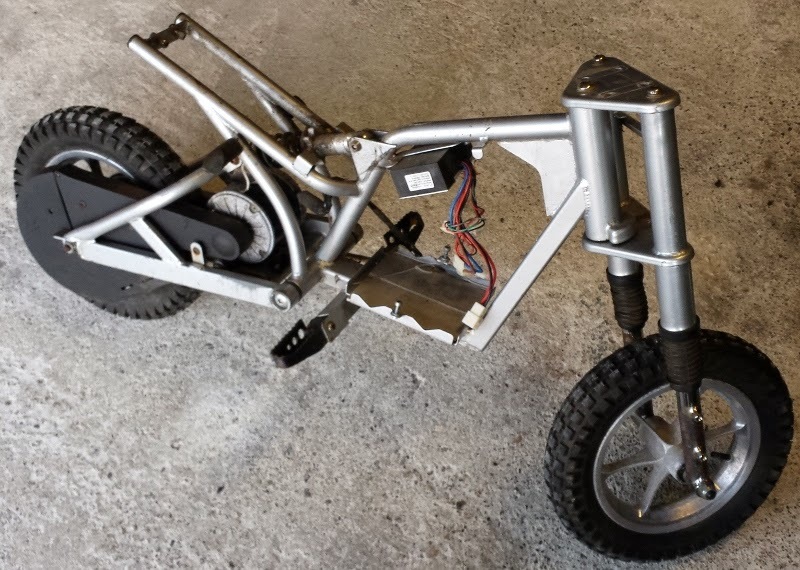 It’s a little pit bike powered by a 350watt motor hooked up to a pair of 12 volt batteries. As well as being inexpensive (they’re about £325 new) they’re quiet and clean. Unlike the toy store variety, it has real pneumatic tyres, front and rear suspension and brakes. Basically, it’s a proper, if low budget, pit bike. It’s also reasonably rare to see them second hand. When a non-runner came up on ebay, I bid fairly high and got it for just £63. The seller was great and even brought it up north a piece so we didn’t have to drive 90 odd miles to pick it up. Beth came with me but that was all we had room for. The Fiat Panda we moved into last spring doesn’t really have the boot space for a bike of any size. Of course, it was only the start. I pulled it apart that night. The forks are pretty much junk and to be fair, I couldn’t figure out how to completely disassemble them. They needed it as they were completely rusted. Wanting to do the job properly, I turned to the internet to find how you get the fork tubes out of the stanchions. That information was not available. However, I did learn that they pretty much don’t seem to work when they’re new anyway. I decided to clean up as much as I could and put them back on. However the forks weren’t the real problem. The Razor MX350 has two 7ah 12volt sealed lead acid batteries and while great for high current, lead acid batteries are a weak point and were always likely to be the reason it didn’t work. I ordered a new pair from Ebay for something like £25 quid and got Kev to do the soldering. At first the new batteries didn’t work but after some fiddling with connections, the bike burst into life. Big smiles all round. All that remained was to get the right riding gear. 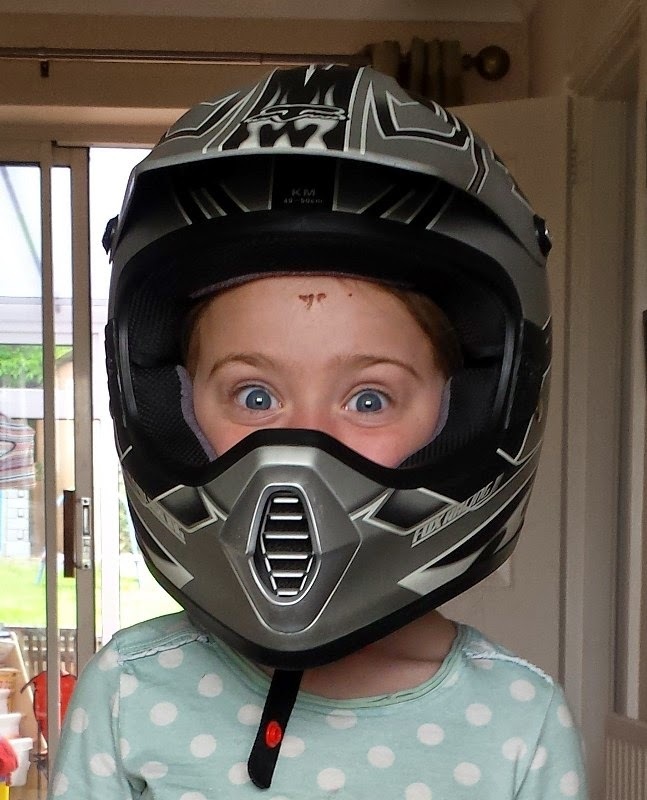 It’s really important to me that Beth knows knows the importance of proper riding gear. I made it very clear that when she rode, she was going to come off and it was probably going to hurt. It’s something we bikers all know and most of us have experienced. She wants to ride so she’s going to come off. 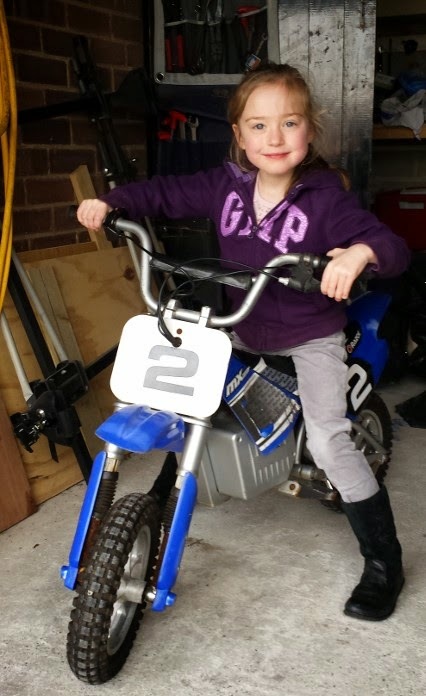 I’d never stop her riding but I will exert my parental duty to ensure she’s well dressed. For now, that means a full road certified helmet that fits properly and the kind of padding used by skaters. Not perfect but better than nothing. I’ll keep looking for more purposeful armor. Months had passed since I embarked on the project and now the bike was ready to ride. Beth was pestering me about it and the only thing that was stopping me was the size of our car. Actually, that’s probably not true. 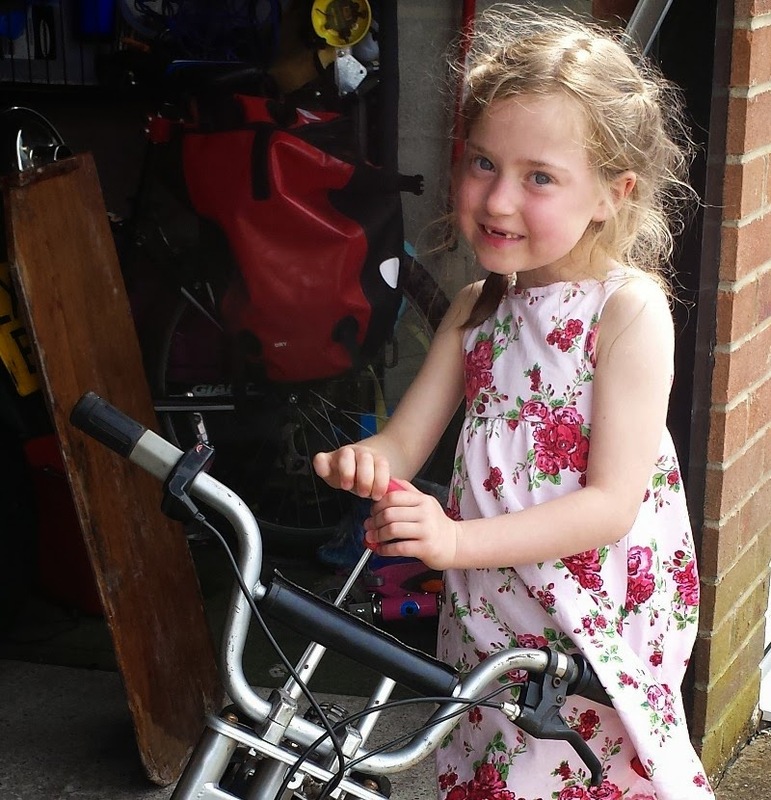 In truth, Beth’s never managed to ride a peddle bike without tears or stabilizers. It wouldn’t achieve anything if this were to graduate to a motorbike. However, I had miss-judged her, something I’m not proud of. Kev provided logistical support, Tom supplied all the encouragement any sibling could hope for and I provided the bike. Her adventurous little spirit had her climb on (after the inevitable argument about how tight the chin strap needed to be) and, well, the rest is in the video.